Italian footballer Mario Balotelli has attacked the country’s first black senator in an online post. Toni Iwobi was elected on Sunday for the anti-immigration Lega party. “Maybe I’m blind or perhaps they have not told him yet that he is black. But shame!! !” the footballer posted on Instagram. Born in northern Nigeria, Mr Iwobi came to Italy in 1976 and became a councillor for Lega (the League) in the Lombardy city of Spirano in 1995. The Italy striker, who plays for French Ligue 1 side Nice, put his post on Instagram on Tuesday. Accompanying the text was a photo of Mr Iwobi and League leader Matteo Salvini, both raising clenched fists and wearing T-shirts saying “Stop Invasion” at an anti-immigration rally. While there have been black members of Italy’s lower house, the Chamber of Deputies, the 62-year-old Toni Iwobi is the first black senator. In a Facebook post celebrating his election, Mr Iwobi thanked Mr Salvini, who he called “a great leader”. 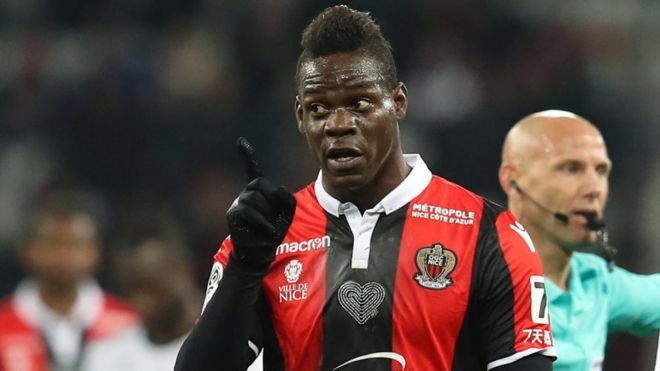 Last month, Mario Balotelli was booked by a referee for pointing out racist chants made during his side’s 3-2 loss to Dijon. Anti-discriminatory body Fare said the striker should get “added protection” from referees for highlighting such abuse. 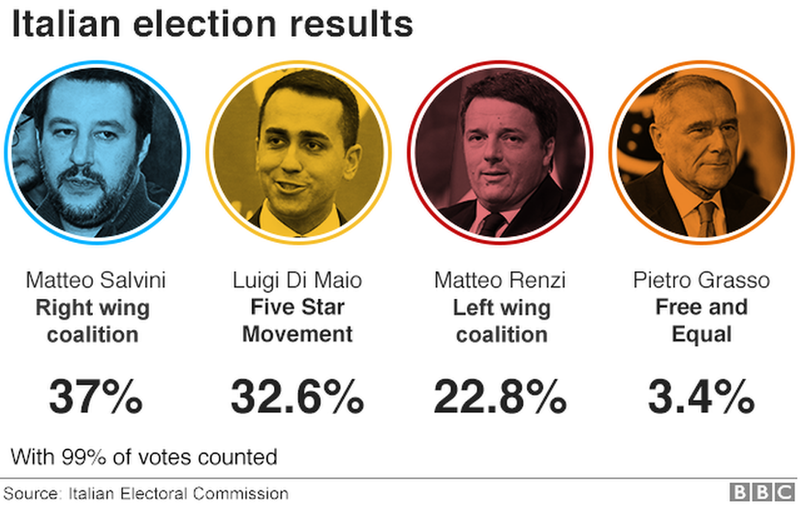 What happened in Italy’s election? No one party gained a majority, but the results show a major shift away from traditional parties. The Eurosceptic, populist Five Star Movement was the biggest single party, with about a third of the vote. Five Star leader Luigi Di Maio announced that his party was open to coalition talks – despite ruling this out in the run-up to the vote. 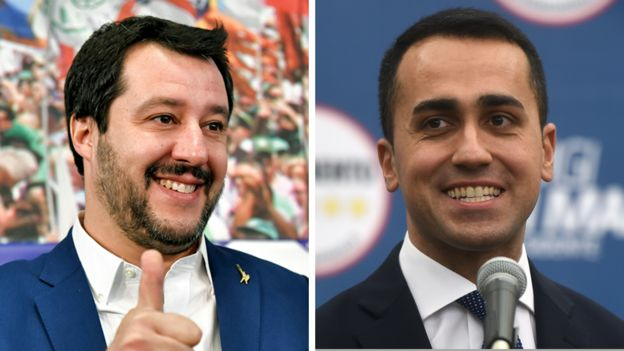 However, the right-wing coalition, mainly comprised of the League and former PM Silvio Berlusconi’s Forza Italia but also including the Brothers of Italy, is also vying for power. Mr Salvini said on Monday his party had the “right to govern” and that although he did not want a broad “minestrone” coalition government, he would speak to other parties to form a parliamentary majority. On Wednesday, former PM Silvio Berlusconi said he would “loyally support” Mr Salvini’s efforts to form a government. His right-wing Forza Italia won 14% of the vote, so was relegated to the second-largest party in its coalition with the League, which won 17.4%. The surge of support for populist parties has been compared with the Brexit vote in the UK and the election of Donald Trump in the US. Five Star was founded in 2009 by comedian Beppe Grillo, who denounced cronyism in Italian politics. It has captured new voters in the poorer regions of southern Italy, feeding off anger over institutional corruption, economic hardship and immigration. Italian voters appear to have abandoned the Democratic Party, led by Matteo Renzi until he quit on Monday, because of dissatisfaction over these issues, and the centre-left coalition is set for a distant third. With more than 600,000 people making the sea journey from Libya to Italy since 2013, immigration was a key issue. But the state of the economy was also at the centre of the debate. In 2016, some 18 million people were at risk of poverty, and unemployment is currently at 11%. 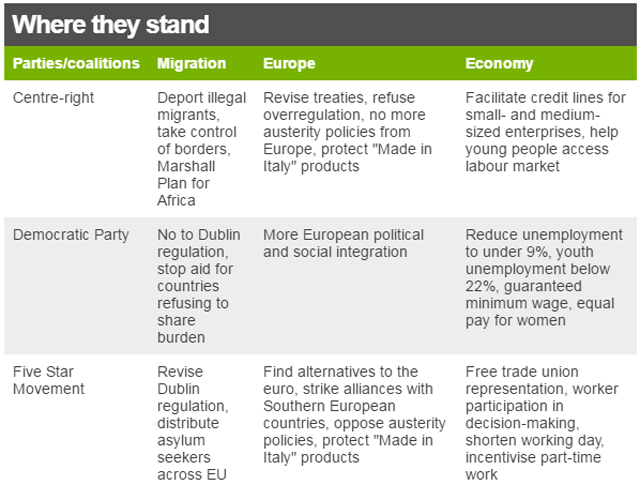 Results from the vote for Italy’s Senate also favoured populists and parties of the right. Five Star performed better than anticipated and was set to take the most seats but miss out on a majority.